QUEBEC – Nemaska Lithium of Quebec City has completed the summer 17,400-metre drill program at is Whabouchi lithium project 300 km northwest of Chibougamau. So far the company has received assay results from 19 of the 27 holes between sections 05+00E and 14+00E. Hole 156 cut three intersections including 1.05% Li2O over 2.6 metres, 1.14% over 5.7 metres, and 1.64% over 13.9 metres. Hole 160 returned 1.44% Li2O over 3.3 metres, 1.09% over 4.3 metres, and 1.96% over 5.3 metres. Hole 161 tested 2.05% Li2O over 13.0 metres, 1.47% over 10.7 metres, and 1.04% over 2.1 metres. Hole 174 assayed 1.56% Li2O over 4.9 metres, 1.26% over 6.4 metres, and 1.35% over 4.1 metres. Hole 178 returned 2.00% Li2O over 4.7 metres, 1.92% over 7.3 metres, 1.61% over 8.6 metres, and 1.49% over 5.7 metres. Hole 182 cut 1.89% Li2O over 3.2 metres, 1.62% over 6.7 metres, 1.37% over 7.3 metres, and 1.62% over 6.9 metres. Recent drilling at Nemaska’s Whabouchi lithium project. 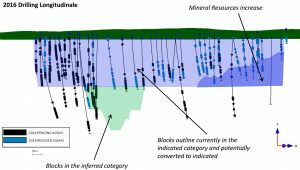 Nemaska said the results received confirm the continuity of the mineralization inside the limited of the pit shell. And they indicate the potential to increase confidence in the resources from surface to 200 metres. Assay results have not yet been received from the deeper holes or the new Doris zone. More results will be posted when available at www.NemaskaExploration.com.